Home Tips & Tricks Don’t Nail Your Glue-Ons! 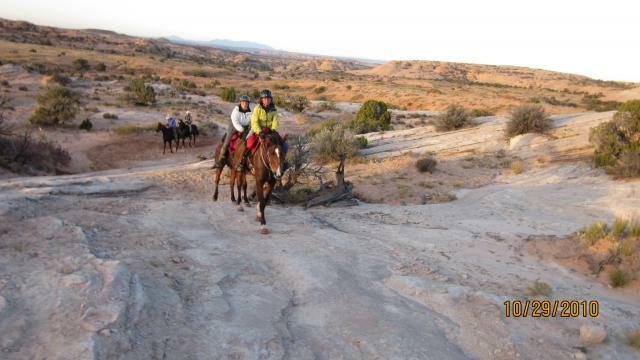 The Moab Canyons 3 Day Pioneer ride just finished. 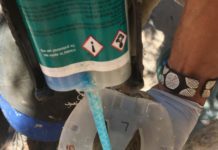 Like every year, EasyCare and Global Endurance Training Center are represented and helping riders with trims, boot fitting, Glue-On and Glove applications and advice. 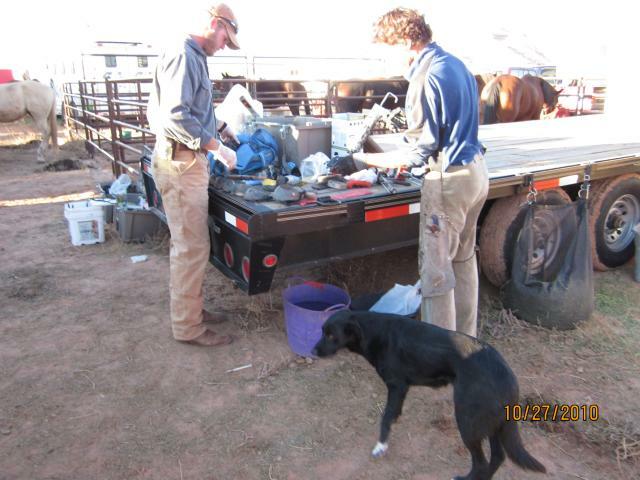 Christoph and Sean Mahoney are preparing boots at the Hoof Care Joint Operations Center. The team, supported by Kevin Waters, worked every day till nightfall. 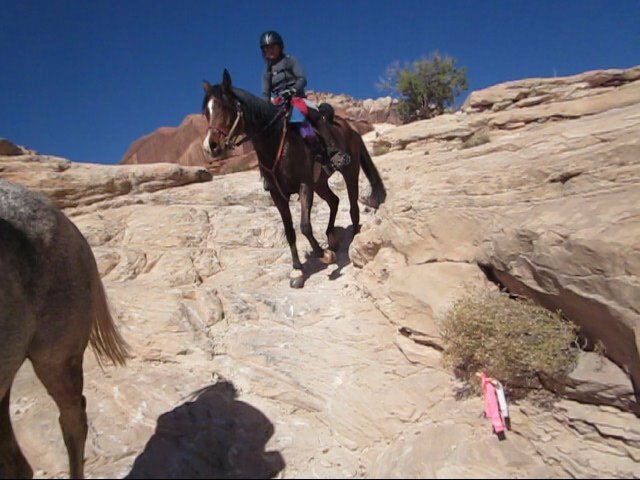 What makes this ride so special is the beautiful scenery and the slick rock. Nowhere else in the West does one encounter these vast areas of red sandstone plates, named slick rock, because in rainy conditions these slabs of sandstone not only get very shiny but also slippery. Contrary to granite and limestone, sandstone is a very soft rock. Hence the formation of the famous arches and the abundant sand trails. The rock itself is often covered by a very tiny layer of sand, invisible to the naked eye. The elements work relentlessly to break up the sandstone into sand. Traction is friction, friction is greater when a softer material meets a harder material or vice versa. It is diminished when a hard material encounters hard material and soft encounters soft material. 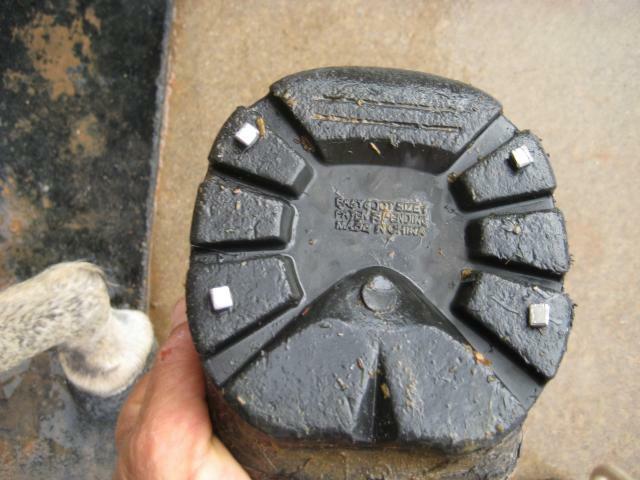 Easyboots and polyurethane horse shoes are about the same density and hardness as a bare hoof. 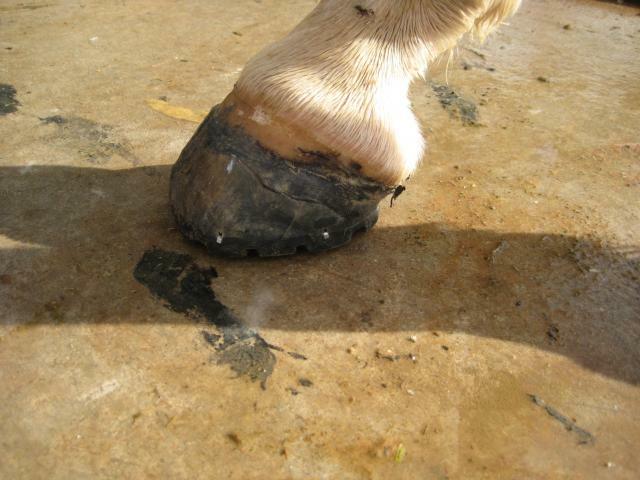 Much softer than steel, bare hooves and EasyCare hoof boots have much more traction when encountering concrete, pavement and other hard rock slabs, while steel shod horses do poorly under those circumstances. 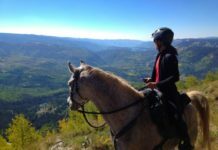 Two years ago at the Big Horn 100, we encountered a big slab of granite rock. The steel shod horse next to me slid like being on ice and fell instantly. Suffered major skin abrasions. 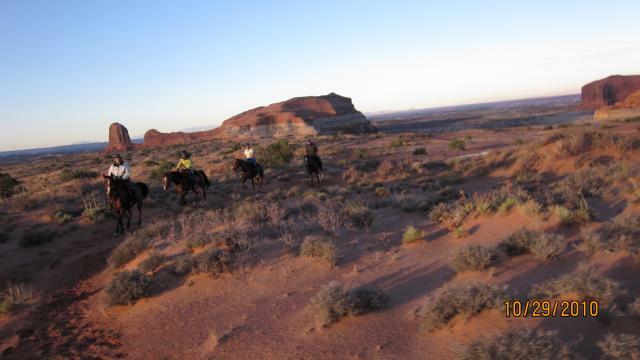 Our booted horses trotted over it without missing a beat. But on the soft slick rock, bare hooves and booted hooves do have diminished traction. It’s the nature of physics. Metal grinds the soft rock slightly when hitting it, thus creating more friction. 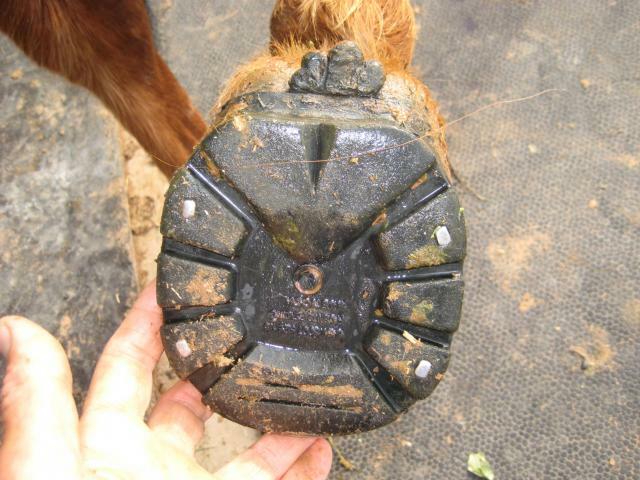 Knowing what we are facing and contemplating a solution, I booted some horses with the special studded Glue ons, provided by EasyCare for the North American Championship last year in Kentucky. 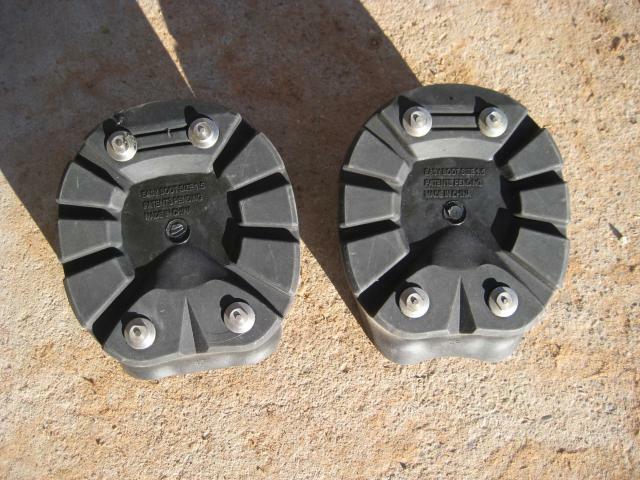 Originally designed for traction in mud and wet grass, I already had used them last year at the Moab Canyon ride with great success. Not having enough of these studded boots available, I came up with an alternative plan for the other horses. 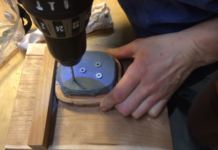 How about placing horse shoe nails at the bottom of the boot and exiting them at the weld line between sole and boot wall? Therefore the nails would never even touch the horses hoof. That thought seemed to be worth a try. After curving the nail tips slightly to the outside, I placed them as shown above. I cut and clinched them like a farrier does when using steel shoes. On the right image, notice how the clinches are so low that the nails never touch the hoof of the horse. 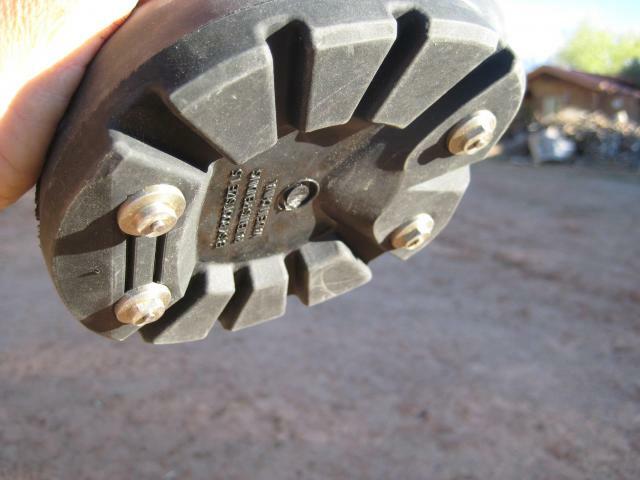 That was a trial, I did not know if the nails will rip out of the boot, cause too much traction or not enough traction. Therefore, I used that method only on my horse, Stars Aflame, on Day One. An example of the slick rock the riders went for several miles. After checking at the vet check at mile 25, everything looked good. The nails were worn quite a bit already, surprisingly, considering all the sand and the soft sandstone we travelled over. At the end of the 50, this is how the bottom of the boot looked. The nail heads were almost level with the boot, but all of them stayed in place nicely. I had great traction all day long, Stars Aflame never slipped even once. That afternoon, I fitted all the other Global Endurance Center’s horses with these nails. During the next two ride days, they all stayed in place, provided just enough friction, but not too much. Equipped with the modified Glue ons, Trinity and Katie Defrancesco descending safely down Wipe Out hill on Day Three. The pair finished second that day. Day Three riders enjoying the rising sun. 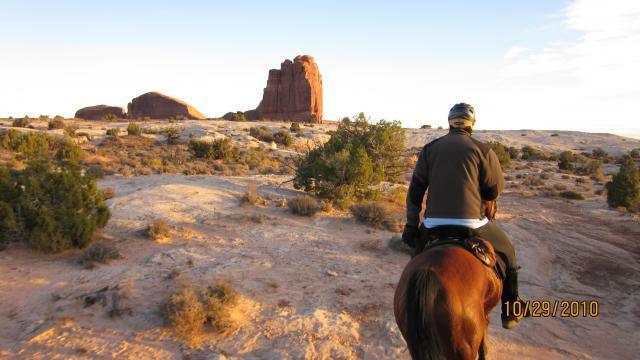 A rider heading towards Tombstone Rock early in the morning, crossing vast areas of Utah’s famous slick rock. The booted horses from GETC won on two days, had two second places and received two BCs. Not a bad showing for the EasyCare Glue-Ons over the challenging slick rock country.